Our hand signed Stan Lee Marvel Collection, Featuring some of the most influential characters to ever grace the covers of Marvel, the 2017 collection has limited pieces remaining. Spider-Man, Captain America, The Incredible Hulk, Wolverine and Iron Man all make an appearance in the supersized collection, which spans over 30 years of comic book history. The impressive body of work pays homage to the incredible superheroes that have been tirelessly penned and inked by some of the greatest artists in the world. Bursting out of their canvas in out-of-this world colour, the pieces are sure to captivate adults and children alike. Each of the ten deluxe artworks is available in a standard edition of just nine, and is hand-signed by the legendary Stan Lee. Due to the unrivalled popularity of previous releases, we anticipate the pieces will sell out quickly. Don’t miss out! Stan Lee was a American comic book writer, editor and former president and chairman of Marvel Comics. In collaboration with several artists, most notably Jack Kirby and Steve Ditko, Stan Lee co-created Spider-Man, the Hulk, the X-Men, the Fantastic Four, Iron Man, Thor, the Silver Surfer, The Avengers and many other fictional characters for Marvel. Lee led the expansion of Marvel Comics from a small division of a publishing house to a large multimedia corporation during an era now referred to as The Marvel Revolution. 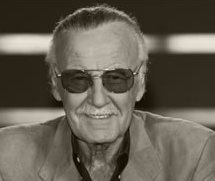 In 1984, Stan Lee was awarded The National Medal of Arts by the United States Congress, the highest honour awarded to an individual artist in the United States. Previous recipients include Georgia O'Keefe, William de Kooning and Stan Lee’s Marvel Revolution extended beyond the characters and storylines, to the way in which comic books engaged the audience and created a community between the readers and the creators. Additionally, he pioneered and advocated the use of comic books to comment on social issues of the time, including bigotry, injustice and discrimination. This got him into some hot water with the rather conservative Comics Code Authority but Stan wouldn't yield, he continued to pursue what he believed in and what he knew his audience wanted; thus the code changed. There is a long established heritage for contemporary sequential art which represents the struggles, the triumphs, the trials and the wonder of the human condition. Whilst comic books take this to a level of fantasy, we can see through Stan Lee’s work the desire and motivation to ground these narratives in reality; enabling each and every one of us to relate to the messages being conveyed.